On the heels of seven straight box office hits, "Ratatouille" continues Pixar's incredible run of success with the charming story of an ambitious rat (yes, a rat!) whose delicate sense of smell and love for gourmet French food compel him to become a chef in the most famous restaurant in Paris - against all odds and with plenty of madcap adventures along the way. "The Art of Ratatouille" explores the artistic vision upon which the film was built with fascinating concept art, including storyboards, full-colour pastels, pencil sketches, maquettes, and more. Extensive quotes from the artists and production team and a foreword by director Brad Bird ("The Incredibles") bring the art to life. 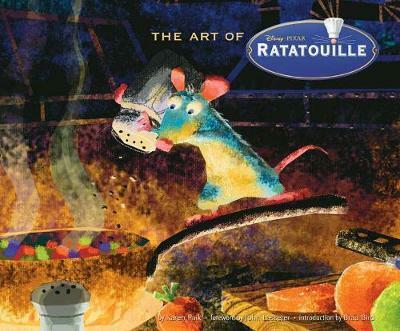 With more than 200 pieces of art and a great design, this is the only adult tie in book for "Ratatouille", which is set for a June, 2007 release. Karen Paik has been working on Ratatouille in the development department at Pixar since 2000. She lives in the San Francisco Bay Area. John Lasseter is the chief creative officer at Pixar, and the director of Toy Story, A Bug's Life, and Cars. Brad Bird is the director of Ratatouille and The Incredibles.